My Calorie Counter is the resource I use to obsessively track my weight, water intake, food consumption and exercise. Somehow, it gives me strength, knowing I'll have to account to a machine for that box of fudge I'm agonizing over. And if I don't exercise every day, the evidence will show up in graphic form. 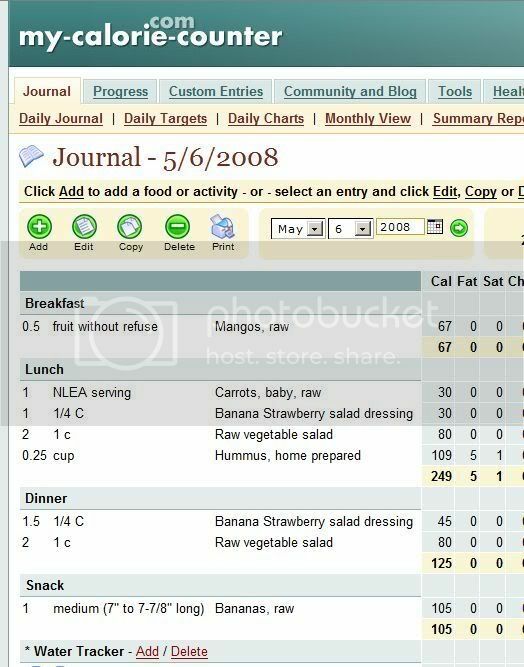 Have you found a good tool for tracking calories and weight? Tell me about it! I *LOVED* this site as well and lost well over 20 lbs using it. I love the little green status bar that lets you know how many more calories you have left. It's tough to UN-install, but I really loved it while using it! AND it's free! I found it when looking for a free weight watcher's alternative and found that it was fantastic!